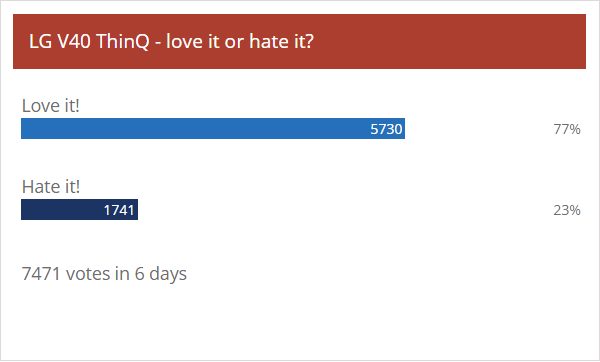 LG strategy seemed all over the place, but the scattershot approach has hit the bullseye – the LG V40 ThinQ got the approval of our readers in last week’s poll, the vote was 3:1 in favor. The company’s firm commitment to the 3.5mm headphone jack and the hardware that makes it awesome (the 32-bit Quad DAC) have not gone unnoticed. LG’s other passion, multi-camera photography won people over as well. The V40 ThinQ is the first phone to offer both a wide-angle and a telephoto camera. Even that aside, the main camera has improvements over the LG G7 (larger pixels and a brighter aperture). And don’t forget the dual selfie camera, that’s an original V-series feature. As usual, the phone got docked a few points for the relatively small battery capacity (3,300mAh) and the notch. These are two things that never fail to draw complaints. Also, some think that the price is too high, but LG phones drop a couple of hundred dollars just months after launch, so waiting a bit will make the price more palatable.